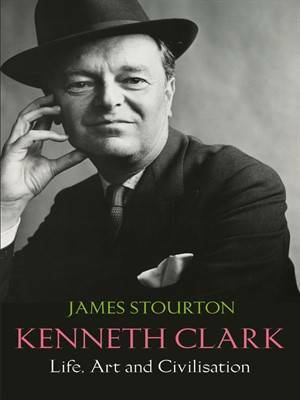 The astonishing life of Kenneth Clark – the greatest British art historian of his time. As writer and presenter of the 13-part TV series Civilisation he was responsible for the greatest syntheses of art, music, literature and thought ever made – 'a contribution to civilisation itself'. Drawing on previously unseen archives, James Stourton reveals the formidable intellect and the complicated private man who wielded enormous influence on all aspects of the arts and drew into his circle a diverse group, many of whom he and his wife Jane would entertain at Saltwood Castle. These included E.M. Forster, Vivien Leigh, Margot Fonteyn, the Queen Mother, Winston Churchill, John Betjeman, Graham Sutherland and Henry Moore. Hidden from view, however, was his wife's alcoholism and his own womanising. From his time as Bernard Berenson's protege at I Tatti in Florence to being the Keeper of Western Art at the Ashmolean aged 27 – by which time he had published The Gothic Revival, the first of his many books – to his appointment as the youngest-ever director of the National Gallery, Clark displayed precocious genius. During the war he arranged for the gallery's entire collection to be hidden in slate mines in Wales, and organised packed concerts of German classical music at the empty gallery to keep up the spirits of Londoners. The war and the Cold War that followed convinced him of the fragility of culture and that, as a potent humanising force, art should be brought to the widest possible audience, a social and moral position that would inform the rest of his career. No voice has exercised so much power and influence over the arts in Britain as Clark's. James Stourton has written a dazzling biography of a towering figure in the art world, a passionate art historian of the Italian Renaissance and a brilliant communicator who, through the many mediums of his work, conveyed the profound beauty and importance of art, architecture and civilisation for generations to come.